Aloo chop is something that works well as a snack and can be used as kofta in a nice gravy and served with chappati. Sometime i stuff seasoned paneer in the chop to make it a little more fancy and tasty. 1. Heat oil and add ginger garlic paste cook for two minutes on low. 2. Add chilli and onion and cook till translucent. 3. Add turmeric pw, chilli pw, coriander pw and cook for a second. 4. Add potato and cook for few minutes. 5. Add garam masala and lemon juice and mix well. 6. Add coriander leaves and allow to cool completely. 7. Make oblong shaped balls and keep aside. 8. Mix corn starch and water to make a thin slurry. 9. Heat oil till 335 F .
10. 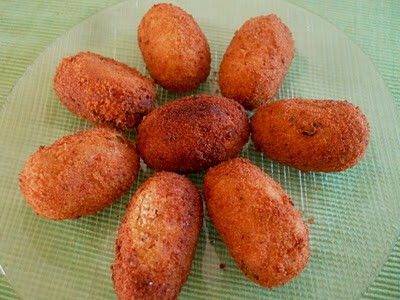 Dip each oblong balls in cornstarch ,roll in bread roll. 11. Drop in oil and cook in till golden. 11. Serve with sauce or chutney. I'm sending this to WYF : Tea Time Snack event at simple indian food. wow... that looks so neat and inviting!!... perfect !